Four days after being appointed as a senator and Public Utilities Minister, former banker Robert Le Hunte's appointment has been revoked. Until this matter is being resolved, Prime Minister Dr Keith Rowley will once again hold the public utilities portfolio Rowley assumed responsibility for this ministry after Port-of-Spain South MP Marlene McDonald was appointed to and then fired as Public Utilities Minister within the space of three days. A statement issued by the Office of the Prime Minister (OPM) said Rowley has been advised that Le Hunte is, " is a citizen of Ghana and accordingly he is not qualified under section 42(1) of the Constitution of the Republic of TT to be a appointed as a senator. The statement said Rowley has informed President Anthony Carmona of this situation and Le Hunte will be rectifying his position. The statement continued that Rowley will advise Carmona to appoint him as senator and minister, "once this is done." The situation is expected to be rectified by Friday. Senior government officials indicated the issue could be one of dual citizenship and it is being addressed. They indicated the statement from the OPM is the Government's official position on the matter. Several attempts to contact Le Hunte for comment were unsuccessful. Le Hunte's retirement as executive director from HFC Bank (Ghana) Limited was announced on August 15 and 16 on the bank's website. The announcement said he was leaving to take up a ministerial appointment in TT. After his swearing in at the Office of the President on August 24, Le Hunte told reporters he had a successful four year tenure at HFC Bank and was determined to use his business skills to serve as a government minister. Le Hunte made no mention of any issue at that time which could affect his senatorial or ministerial appointments. He did not believe his post to be blighted, considering that D'Abadie/O'Meara MP Ancil Antoine, Laventille West MP Fitzgerald Hinds, McDonald and Rowley, each held the portfolio prior to his appointment. Attorney Kenneth Lalla SC said the Attorney General is responsible for advising the Prime Minister and the Government pertaining to the law. While said he did not know the facts of the matter, Lalla said the Ministry of the Attorney General and Legal Affairs normally does checks to ensure that government appointments adhere to constitutional requirements. He said the Constitution does not debar anyone who has dual citizenship from being appointed as a senator. However he said anyone who is a citizen of another country and not a citizen of TT, cannot be appointed as a senator.Lalla said clarity must be provided in Le Hunte's case. He did not believe that Le Hunte was at fault in this matter. Section 42 (1) of the Constitution states that no individual can be qualified to be appointed as a senator if they are a citizen of a country other than TT, having become such a citizen voluntarily or is under a declaration of allegiance to that country; is a member of the House of Representatives; is an undischarged bankrupt having been adjudged otherwise declared bankrupt under any law in force in TT; is mentally ill, within the meaning of the Mental Health Act; is under sentence of death imposed on him by a court or is serving a sentence of imprisonment, by whatever name called, exceeding 12 months imposed on him by a court or substituted by a competent authority for some other sentence imposed on him by a court, or is under such a sentence of imprisonment, the execution of which has been suspended; is disqualified for membership of the House by virtue of any law in force in TT, by reason of his having been convicted of any offence relating to elections or is not qualified to be registered as an elector at a parliamentary election under any law in force in TT. Section 41 of the Constitution states an individual can be appointed as a senator once they are a citizen of TT and 25 years of age and older. 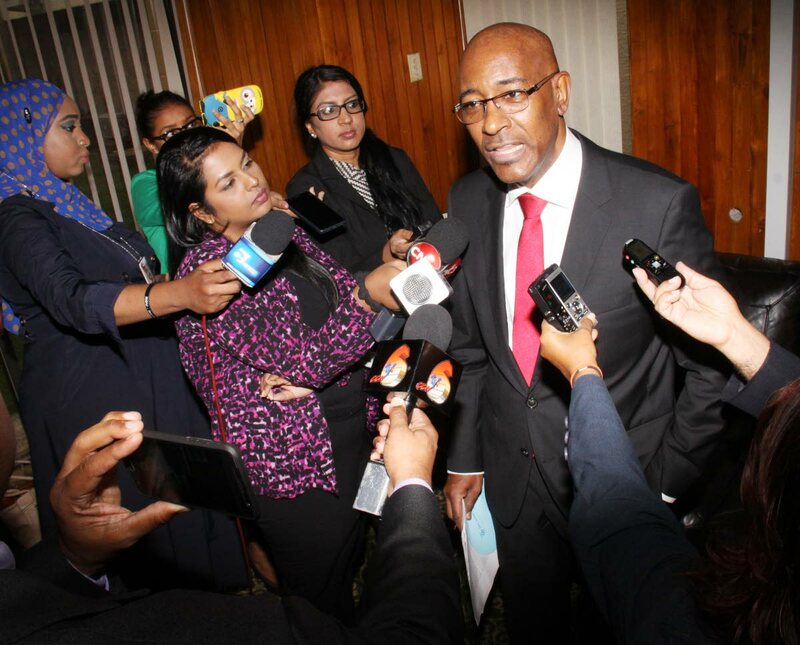 United National Congress (UNC) chairman David Lee described the situation as embarrassing and , "another conundrum by the PNM (People's National Movemnent) Government." Lee said such a situation would never have arised under the former Kamla Persad-Bissessar administration. "Where is the due diligence by the Office of the Attorney General?" Lee asked. He also claimed the situation reflected a lack of integrity by Le Hunte. Lee said Le Hunte was no stranger to the political arena and should have known what are the requirements to be appointed as a senator. He said the Opposition is totally against Le Hunte's re-appointment as a senator and government minister once the issue is rectified. Lee wondered whether Le Hunte was competing with McDonald to be the person who was hired and fired the quickest as a government minister. In a subsequent statement, the UNC claimed Rowley's inability to fill a Cabinet vacancy without incident is, "a failure of leadership in the highest order." The UNC charged this was a gross violation of the Constitution. The party warned Le Hunte's re-appointment, "will be met with tremendous resistance." Rowley fired McDonald on July 2. He subsequently said McDonald's dismissal was connected to the presence of Sea Lots personality Cedric Burke,at the Office of the President in St Ann's on June 30, when she was sworn in. After the September 2015 general elections, McDonald was appointed Housing and Urban Development Minister. She was fired in 2016 from that post after questions had arisen over her alleged recommendation of public housing for her male companion, Michael Carew. As former community development minister in the former Patrick Manning Administration in 2010, McDonald was questioned aboutr donations from her ministry of $375,000 and $200,000 plus another sum to the Calabar Foundation. Carew was alleged to be a director. Mc Donald had assured all was above board. An investigation by the Integrity Commission into the matter found no evidence of wrongdoing by McDonald. Reply to "Rowley back as Public Utilities Minister after Le Hunte’s appointment revoked"